In the study and diagnosis of disease, pathologists must undertake a very complex process in decision-making and diagnostic classification. The practice of histology and cytology demands the wide use of human perceptual and cognitive processes. Using a microscope and glass slides, diseased sections can be visualized by changes in the architectural structure of the tissue, cytonuclear changes, and molecular changes observed with the use of molecular markers. Digital pathology is the technology that generates high-resolution images from these whole glass slides which then can be analyzed and managed with software. Hence, these digitized slides or virtual slides can significantly optimize the workflow of the pathologist. Digital pathology products often encompass methods to scan, visualize, manage, analyze, and share digitized slides. Digital scanners are often specialized for different uses such as for fluorescence, oil immersions, and varying throughput levels. Images can be adjusted and viewed from multiple perspectives. Image management systems can be implemented to improve laboratory efficiency. 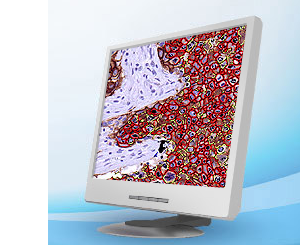 Software for image analysis can aid the pathologists in diagnosis. Finally, organizations provide venues where images can be shared seamlessly through common electronic portals. Digital slides can serve a multitude of purposes including collaborative efforts in research and clinical practice, electronic storage, quality assurance, and education. A more comprehensive list of advantages can be found in the gray link below. Disadvantages include high initial setup costs, possible loss of privacy and possible corruption of patient data. However, it is well agreed by the pathology community that benefits of digital pathology outweigh the negatives. Additionally, there is a trend toward engineering algorithms and standardization tools such that more applications of digital pathology will incorporate artificial intelligence to make automated diagnoses. A discussion of quantitative image analysis methods is reserved for the techniques section.